”Eileen was engaged to Warrenpoint Jeweller Aiden McAlinden: a native of Derrymacash, Lurgan, where his mother was Principal/Teacher and the son of a farmer. Aidan married and had 4 children; the first daughter was named Eileen”. (Red Book-Byrnes family notes). Eileen died 16th April 1953 aged 27. 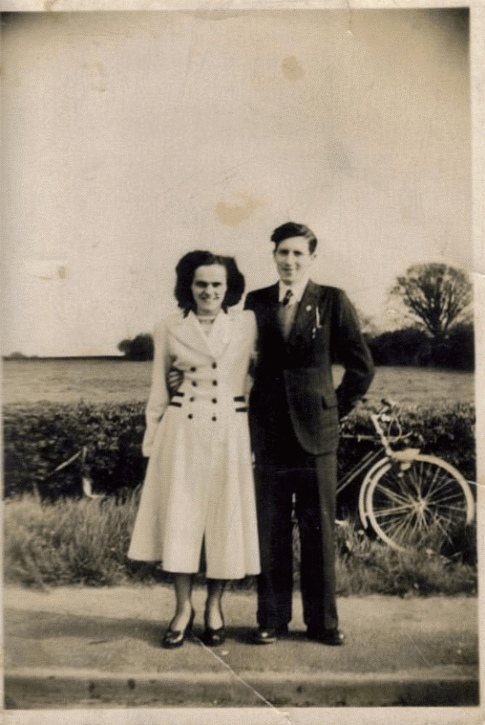 In June 1945 Peter Hannaway married Sarah Byrnes in Lislea, County Armagh. Welcome to the pages of their families. For reasons of privacy the names and details of living family members are not included without their permission. My thanks go to Benedict Martin for his research and his encouragement. Likewise to Paul Byrnes for his generous research of the Byrnes’ members who moved to Scotland or to the north of England. To Anna McParland (Doherty) and Patsy Grey (Collins) for their photographs and listening to my endless questions. Many documents and photographs have also been supplied by Rich and Candy McGinnis in the USA-including original photographs of Hannaway's from the early 1900s. Eugene McCann shared his extensive local history knowledge & research by assembling histories of various families. Please let me know of any errors or missing persons using "Contact Us" Your stories or photographs are always welcome. Many chronicled here do not have a photo and ideally each person should have a biography. Hannaway or Hanaway This article summarises the distribution of Hannaway and Hanaway households in 1864 throughout county Armagh. The accompanying map shows the locations mentioned. In 1864 Patrick Hanaway was the only Hanaway or Hannaway tenant on the western slopes of Slieve Gullion, overlooking Mullaghban. (Griffiths Land Valuations). We also know he wasn't there in 1828. Yet on the other side of Slieve Gullion there were nine Hanaway households - mostly in Aghayalloge (townland). Patrick’s holding is in Slieve Gullion townland and updates to the land records show that Rose Hanaway replaces him in 1872/73. John and Hugh Hannaway lived on this holding, their parents were Peter and Rose Hanaway/Hannaway. John married into Levelamore, close by. Both spellings were used because at that time most householders could not read/write so clerks would spell names as they heard. Future articles will follow the search for our Hannaway family roots. Birthplace of Peter Byrnes? Peter Byrnes/Burns (d1908) is the earliest verifiable member of the Byrnes family of Ummeracam/Umeracam to date. There are some views that he was not from Ummeracam but from Carriff/Carrive near Silverbridge. This document outlines what we know of his early years. Hannaway twins Hugh Hannaway and Bridget Henry lived in Aughadanove/Adanove townland and had two daughters named Catherine. The first Catherine, born in 1881, was a twin to Peter Hannaway. More recently Patrick-James Hannaway (b1917) and Vera also had twins: the late Peter (d2008) and (Michael (d2007). Owen Mackin from where? These 1870s Land Records show entries for Owen Mackin. Sarah Mackin’s grandfather was Owen Mackin. Owen first appeared in Ummeracam (Ball) North in the Griffiths Land Valuations Revisions. He appears in an 1871 updating entry for a tenancy . But where did he originate from? In the nearby townland of Tullynavall an Owen Mackin’s tenancy changes in 1880 to a new name Mick Mackin. Are these the same Owen Mackin?